Pictured below is a standard single lever ball-type faucet. It is identified by the ball and cam, which controls water flow and temperature. 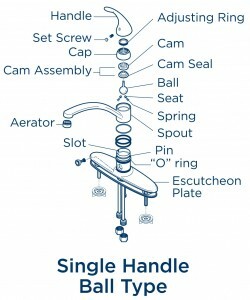 The replacement of “O” rings, seals and seat springs is the common method of repair for a dripping faucet. 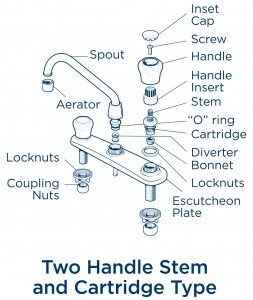 Pictured below is a 2-handle stem & cartridge faucet. It is identified by the 2 individual handles, which control water flow and temperature. 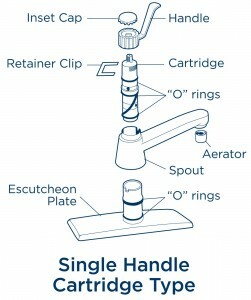 Replacement of the cartridge assemblies and “O” rings is the common method of repair for a dripping faucet. Pictured below is a single handle cartridge faucet. It is identified by a single handle and sealed cartridge, which controls water flow and temperature. Replacement of the cartridge assembly and “O” rings is the common method of repair for a dripping faucet.